I enjoy a good cup of coffee. I am not talking about the over roasted, burnt tasting stuff that they try to pass off as coffee at Tim Hortons or Starbucks, I mean a good cup of coffee. A cup of coffee that makes you site back and go “ahh”. A couple of places that I have found a real good cup of coffee include the Broadway Roastery in Saskatoon and in Rosthern you should check out the Station Arts Centre Tearoom. Since moving back to Regina I have not gone hunting for the best place to get a real good cup of coffee, but there is a new place that has opened not far from the Home Depot here in the north end. Got a flyer in the mail for it recently. It is locally owned and I would prefer to support a local person and their business. The best place that I have found to get a real good cup of coffee no matter where I have lived is at the Cafe Robertson. 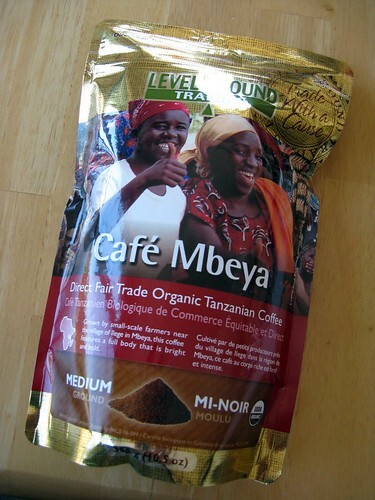 We buy fair trade coffee from Level Ground Trading and I have been very pleased with how good it tastes. That first cup in the morning just makes me feel nice and warm all over. Not only does it taste good, I can feel like I have helped do a small part in supporting fair trade and the people that grow and produce such a great cup of coffee. If you want a great cup of coffee give fair trade coffee a try from Level Ground.